Can I add to a workflow contacts who were copied or moved to a different campaign? You can use the Copied to campaign? condition to add contacts to a workflow when they are copied to a different campaign. Use Moved to campaign? to add contacts to a workflow when they are moved to a different campaign. Note: The elements won’t work for contacts who are copied or moved manually. Contacts need to be copied or moved via API or in a different workflow. Copied to campaign? and Moved to campaign? have an “if yes” (green) connector. The elements can be used as start elements only. The conditions will trigger actions for contacts who are moved or copied while your workflow is running. That means that the conditions work only for the contacts who are moved or copied after the workflow starts. How do I set up “Copied to campaign?” and “Moved to campaign?”? Drag and drop the element you want to use to the workspace and open element Properties. Expand the list and select the campaign contacts are copied or moved to. When that happens, they’ll enter this element. Optionally, turn on the option for the element to Run multiple times. 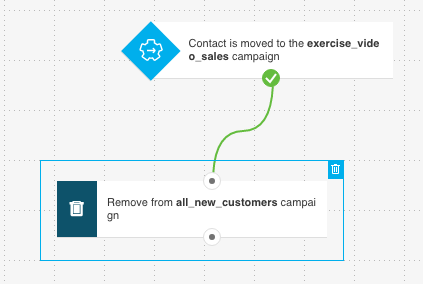 How can I use “Moved to campaign?” in a workflow? You can use Moved to campaign? 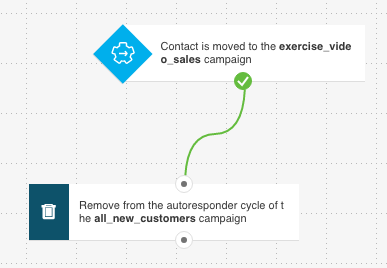 to set up workflows that remove contacts from other campaigns or from an autoresponder cycle. For example, you’d like your contacts to stop receiving autoresponders targeting all new clients when they’re moved to a campaign for customers interested in a specific service you offer. For this, you’ll need two elements—Moved to campaign and Remove contact. To set up this workflow, in Moved to campaign, select the campaign that becomes the trigger when contacts are moved to it. In Remove contacts, choose Autoresponder cycle and select the campaign it’s in. That way the contacts stay in the campaign but don’t receive autoresponder messages. If you’d like to remove your contacts from one campaign once they’re moved to another, use Moved to campaign and Remove contact. In Moved to campaign, select the campaign that becomes the trigger when contacts are moved to it. In Remove contacts, choose the campaign you’d like the contacts to be removed from.